The best man, Jens, steps up into the spotlight to give his speech after the last speaker has returned to her seat and all of the guests have settled down. He holds all of the handwritten papers that he has prepared for his big speech tonight, and he holds the microphone in his other hand. 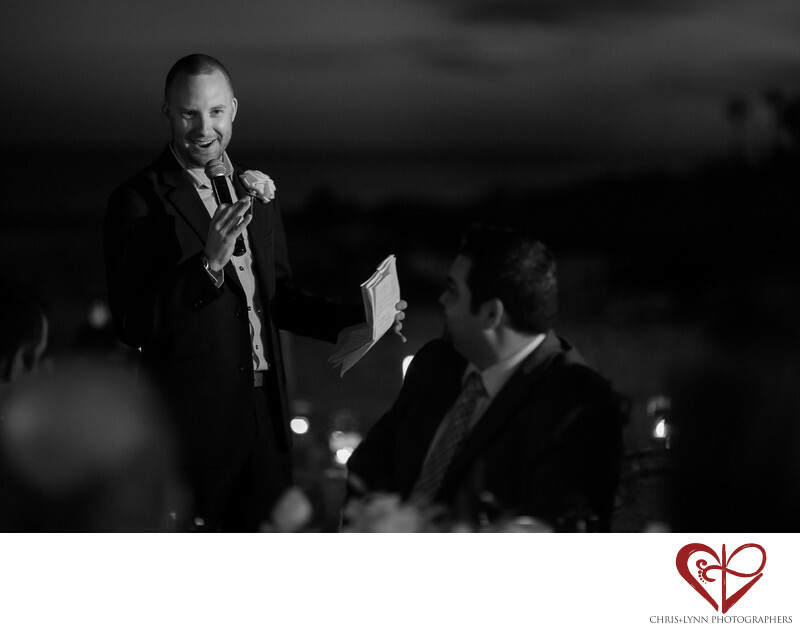 He begins his speech with a big smile and launches into accounts of the adventures he has shared with the bride and groom, the great memories they share, and everything he wishes for them in the future. The horizon is dark, but the candlelight and the light of the patio cast a glow on the speaker and the guests, creating a romantic feel. The guests all listen attentively to the last speaker. The groomsman finishes his toast to the bride and groom with thoughtful words.